In 1955 when American heiress Marjorie Merriweather Post purchased the 25 acre Hillwood Estate in Washington DC, she remodeled the house and gardens to reflect her passion for European decorative arts and landscape design. 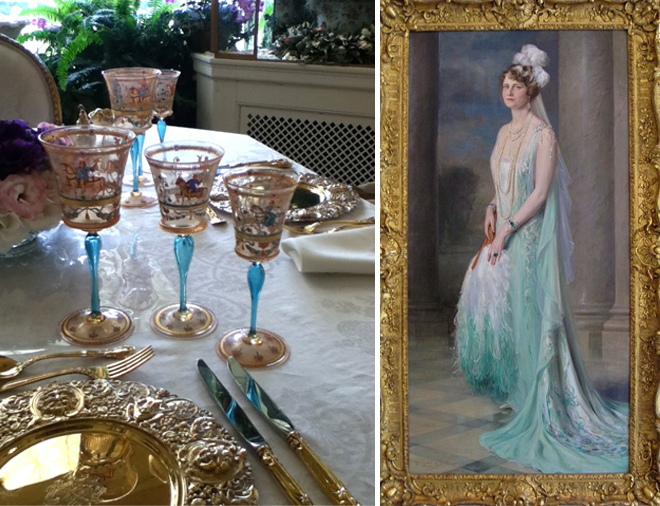 Upon her death Post bequeathed the house and collection to the public, and the museum provides a window onto the world of the original owners of the art as well as the lifestyle and taste of the woman who collected it. The mansion’s reception rooms showcase Mrs Post’s collection of French and Russian imperial 18th and 19th century paintings and furnishings. Portraits of French and Romanov royals survey the Louis XVI furniture resplendent with marquetry and gilded brass, Sèvres porcelain, Beauvais tapestries and Fabergé eggs. The much married heir of midwestern entrepreneur C.W. Post, founder of the Postum Cereal Company, looked to America’s eastern establishment and European aristocracy to fashion her identity and ambiance of her home. The result is a bit of an aesthetic hodgepodge. When well advised by influential art dealers like Sir Joseph Duveen, her purchases were sure, but left to her own devices she veers into pastiche. Glamour portraits by contemporary artists of she and her daughters (including hollywood actress Dina Merrill) dressed to the nines, dripping in jewelry and frippery are pretty dreadful. When wealthy Americans try to emulate historic European homes and decor it inevitably comes off as false. The patina is missing. Not enough dust balls, worn parquet and frayed upholstery. 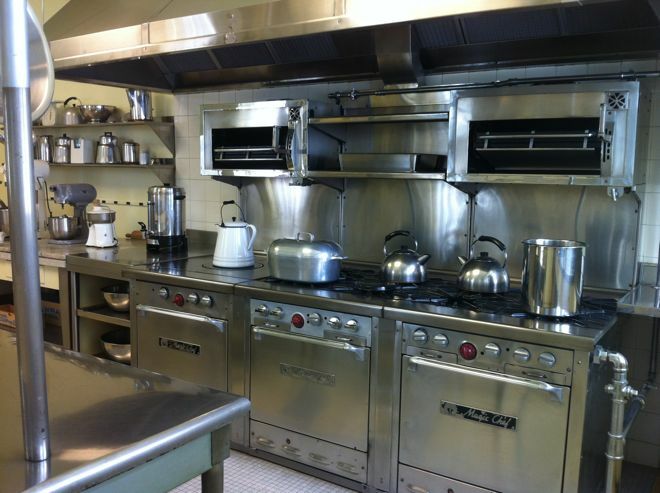 The real treasure at Hillwood is the kitchen and pantry. Talk about authenticity. 100% American ingenuity. Julia Child would think she’d arrived in heaven. After her father’s death, Mrs Post became involved in the family business and her second husband businessman Edward F. Hutton acquired Birdseye frozen food as part of a series of acquisitions that transformed the company into General Foods. The kitchen and pantry are models of 1950’s modernity. 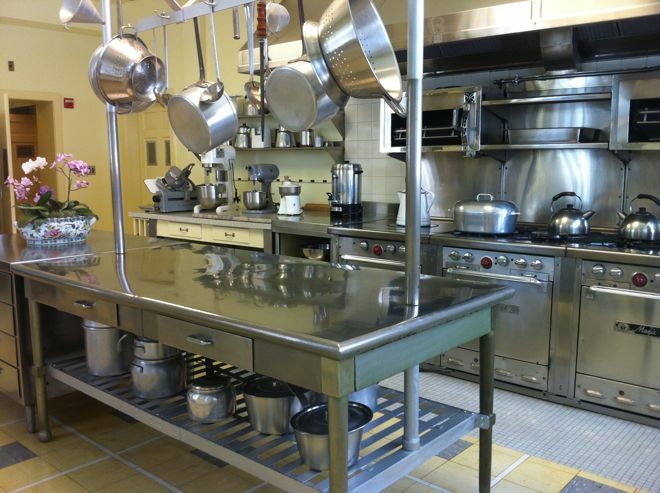 Each utensil and appliance is left in place as though the staff are about to show up to prepare for the next function. For foodies and lovers of Americana it’s not to be missed. 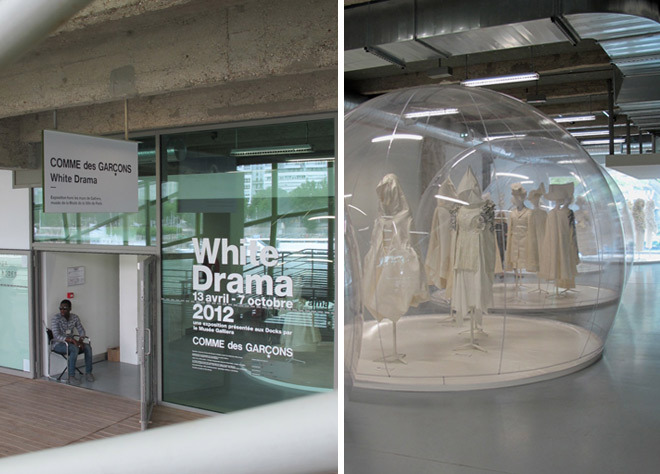 Paris has a new fashion temple on the Seine – Les Docks, Cité de la Mode et du Design – between Gare d’Austerlitz and the BNF. 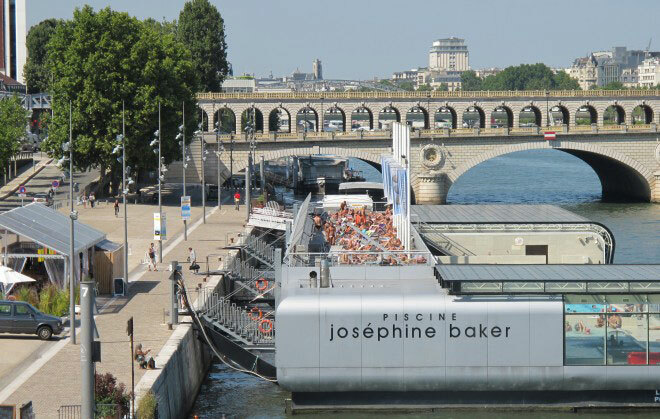 Another style scoop for the Left Bank’s eastern waterfront. The undulating lime green facade is hard to miss from the opposite bank. Architects JAKOB+MACFARLANE created a diamond pattern ‘Plug-Over’ for the existing industrial dock building. Goals of the state-funded project include attracting visitors besides the fashion/design tribe, and furthering the city’s reputation as world fashion capital. Outdoor space is expansive, with wooden decks on the street and roof levels. Plenty of seating is provided for sunning, sipping drinks and surveying river traffic. It’s an ambitious 4-story complex encompassing a museum/gallery, conference & showroom space, offices, boutiques and 4 bar/restaurants. The MoonRoof quickly became a hot RDV for drinks and celebrations. A sprawling deck surrounding the surprising vegetal roof offers spectacular river views. 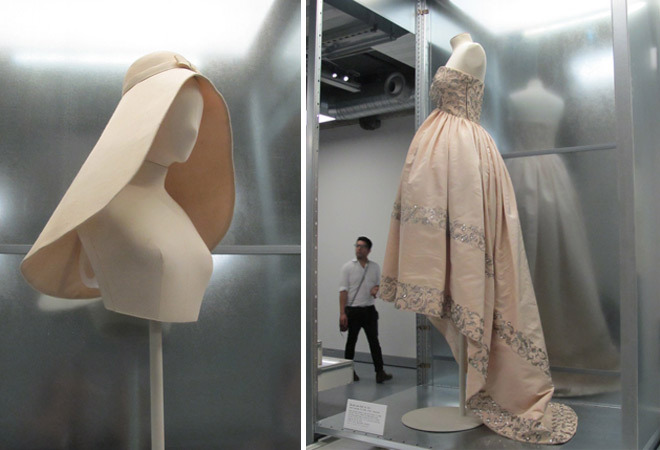 The Balenciaga exhibit marks the 40th anniversary of the Spanish couturier’s death. It showcases 40 garments created between 1937 and 1968, alongside his private collection of 18th and 19th century fashion, costumes and accessories. 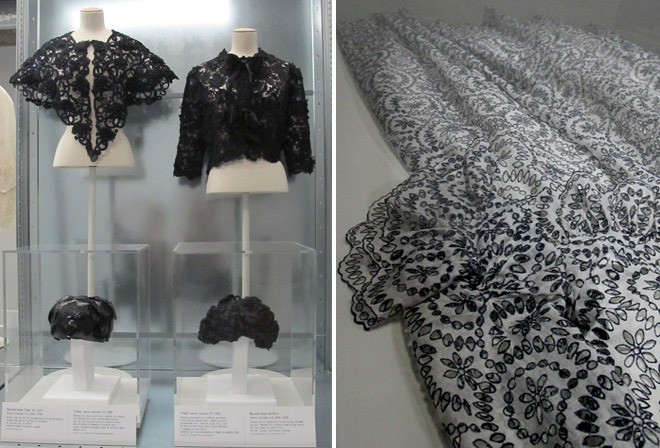 The juxtaposition demonstrates how folkloric costumes and 19th century fashion inspired his work. 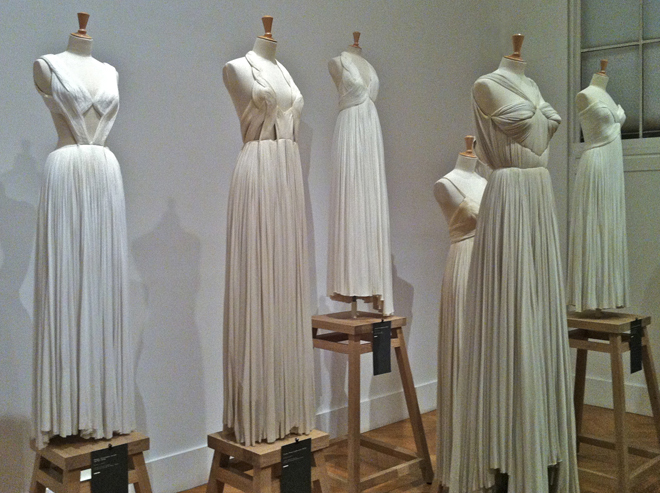 The installation is a bit disconcerting – with couture pieces on mannequins above cantilevered drawer display cases. I’d prefer seeing the gowns at ground level, visible from several vantage points. Looking up at clothing is not a flattering angle. One of several exquisite Balenciaga hats – a sweeping sculptural bridal model, was reprised in the 2012 Balenciaga spring-summer collection. 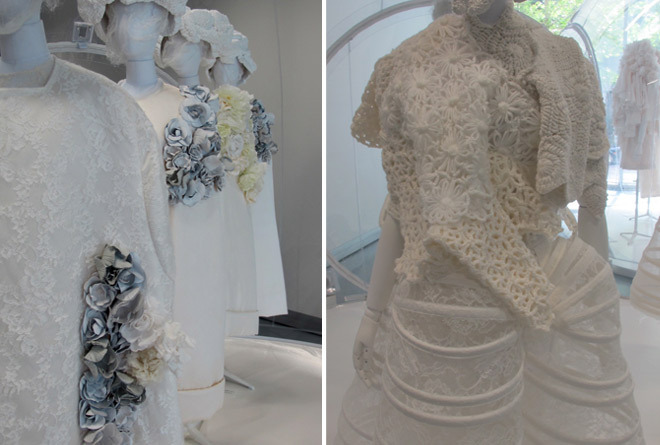 While the couturiers’ couturier leaves you with visions of black lace mantillas, the accompanying show of Rei Kawakubo’s 2012 spring-summer collection, is a blizzard of creamy white. Mannequins are grouped by theme in plastic bubble tents. The effect is eerily poetic. Her runway show received glowing reviews; a moving spiritual parenthesis amid a succession of commercial collections. Striking parallels exist between the two exhibits – sculptural form married with decorative embellishment, solid colors versus prints, gathered seaming and substantive fabrics that imbrue garments with ceremonial solemnity. Left feeling I’d been witness to rituals conducted by a high priest and priestess of fashion. Make a detour to the 15th arrondissement, for the show and the museum. It’s close to Gare Montparnasse at 8, rue Antoine Bourdelle. Another innovator who changed their name. It’s uncanny how many creative people reboot their persona with a name change. Germaine Krebs (1903-1993) did it in stages; adopting Alix Barton when she began working as a designer in the 1930’s and Madame Grès after launching her couture house in the 1942. Grès was an anagram of her husband’s name, Serge Czerefkov, a Russian painter. Madame Grès trained as a sculptor, so it’s fitting that a major show of her couture clothing, sketches, and collection of fashion and portrait photography featuring her designs by preeminent photographers of the 1930s through the 1980’s – is installed in the former home and atelier of neoclassical sculptor, Antoine Bourdelle (1861-1929). Though an intimate museum, it’s surprising spacious and comprises lovely gardens.